Take a moment to consider the Neocon camp’s over-reaction to the inchoate challenge to its dominance posed by the Trump administration. When we speak of The Long Game, we speak of national/alliance policies that continue on regardless of what political party or individual is in office. The Long Game is always about the basics of national survival: control of and access to resources, and jockeying to diminish the power and influence of potential adversaries while strengthening one’s own power and influence. As I have been discussing for years, there are inevitable conflicts within the inner circle that executes The Long Game within each nation/alliance. In periods of active confrontation, the various factions tend to rally round the core game plan–for example, in the Cold War with the USSR, the U.S. Long Game was containment. Anyone arguing for all-out war or appeasement was quickly marginalized. 1. The dominant Neocon camp that seeks to actively intervene on a global basis (mostly civilian). 2. The “rogue progressive” camp that views the Neocon strategy as a disaster for America’s long-term interests, i.e. The Long Game (mostly military or military-related). Whatever you think of President Trump–pawn, buffoon, loose cannon, evil incarnate, whatever–please understand that his administration is viewed as a potentially disruptive threat to the dominant Neocon camp, which expected a seamless transition in the Executive branch from President Obama to Hillary Clinton, echoing the seamless transition from G.W. Bush to President Obama. The camp that sees the Neocon strategy as failed and dangerous to the interests of the American people and the nation’s Long Game had essentially zero leverage in the presidencies of Bill Clinton, G.W. Bush and Barack Obama. After 24 years of unchallenged power, the Neocons are understandably going into attack mode against anything and everything that poses the slightest risk to their grasp on power. The possibility that the anti-Neocon camp might gain a foothold in the Trump administration has caused the Neocon camp to launch an all-out war against anyone and anything that could offer the “rogue” insiders a toehold. Since the Neocons have assembled the greatest Murder, Inc. machine in world history, this obsession with killing anyone who poses the slightest threat to Neocon hegemony is understandable. But it’s tricky to liquidate Americans without questions being asked (all those suspicious “suicides”–hmm). So the Neocon tactic of late is to sift through the NSA and CIA’s voluminous surveillance data and fish out something damaging to their targets. The Neocon camp has also ordered its media arm–the corporate-owned mainstream media– to go into full attack mode. Bernie Sanders got a small taste of the MSM’s one-sided, negative coverage, but that was merely a training exercise for the main war against any and all potential threats to the Neocon camp’s total dominance. It’s helpful to position this discussion of the warring camps in America’s Deep State in a larger context of The Long Game. 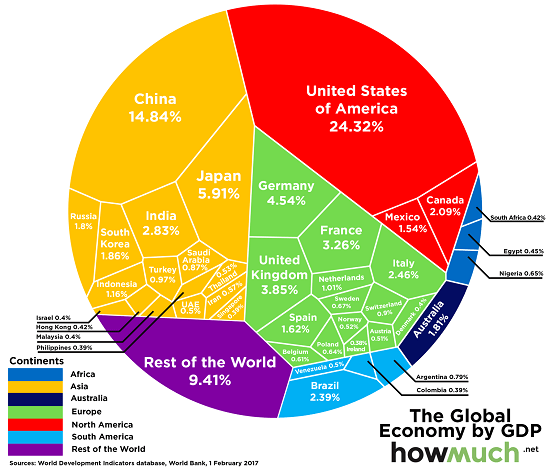 Let’s start with Russia, and recall that the Western Neoliberals (do-gooders one and all, of course–we only have your best interests at heart, really really really) forcefed a “market economy” (i.e. rigged to benefit banks and cronies) to Russia in the early 1990s. The net result was a Cronyist-Mafia-Racket economy, a disaster for progressives within Russia. The inevitable blowback was a re-energized central state, which generated another set of difficulties. Then the Neocon-led NATO expansion into Russia’s historical buffer zones triggered alarm. Recall that Russia has centuries of experience dealing with invading hordes from the East and the West. It’s not too difficult to see why Russia isn’t feeling particularly warm and fuzzy about the Neoliberal-Neocon Long Game. As for China–China has one client state: North Korea. Talk about a client state from Heck. There aren’t any good solutions in China’s view to North Korea: if it collapses from internal disorder, a humanitarian crisis quickly moves across the border into China. A nuclear exchange between North Korea and the U.S. is not a desirable outcome, nor is a conventional war with South Korea. 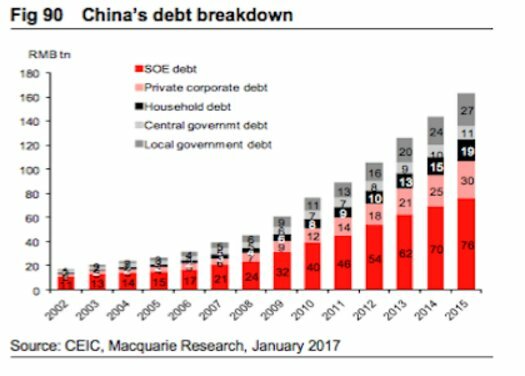 China’s debt expansion: China’s GDP up 3-fold since 2006, but debt is up 6-fold–and still ramping up fast. 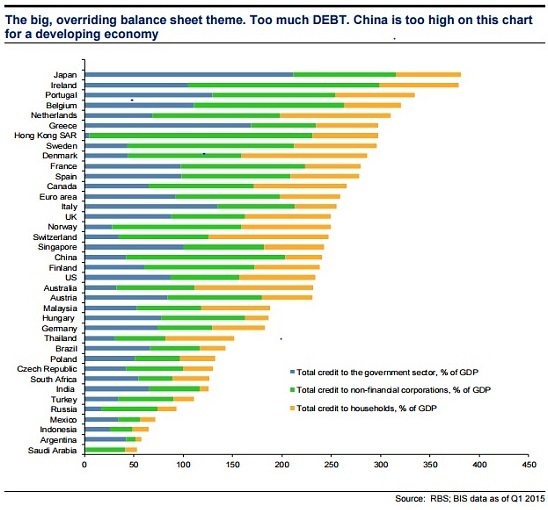 For context– snapshots of global GDP and global debt. As I noted yesterday in The Media’s Missing the Point: Syria, Empire and the Power of Signaling, power is a function of a nation’s total output, not just its military capabilities. 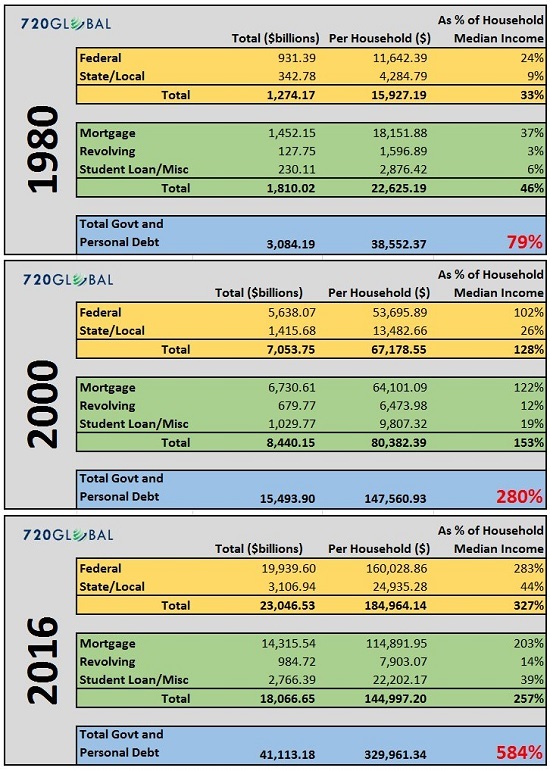 Here is a look at America’s rapidly expanding debt load: the acme of “unsustainable.” This is the disastrous harvest of Neoliberal financialization on a global scale. 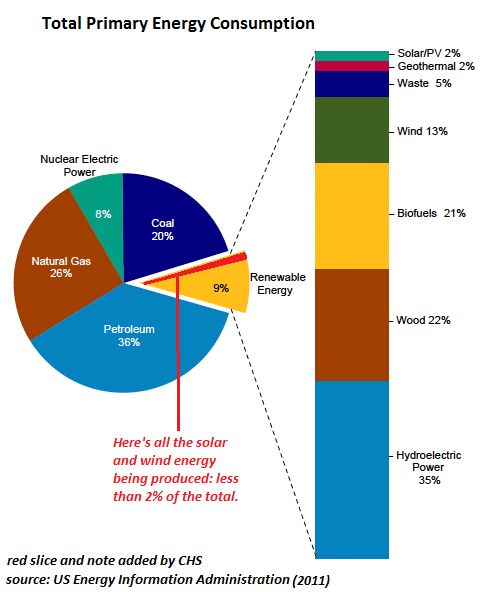 Though this chart is of U.S. energy, with a few minor modifications the mix reflects global energy. Fossil fuels still dominate energy production and consumption. Energy is the master resource–little else can be extracted, processed or transported without fossil fuel energy. Is it any wonder that a mad scramble is on in the mideast? Consider that Russia and the U.S. are (for the time being) both major global producers of fossil fuels. Take a moment to consider the Neocon camp’s over-reaction to the inchoate challenge to its dominance posed by the Trump administration. What does their frantic over-reaction and full-court press by the media signal about their grasp on history and power? What it signals to me is 1) they know they’re losing the consent of the American public and are frightened of losing power 2) they’ve lost the judgment of history–their strategy has been an unmitigated disaster on all fronts: their Neoliberal strategy has weakened every nation that has embraced it (including the U.S.) and their interventionist Neocon strategy has failed in its objectives, generated uncontrollable blowback and unintended consequences and weakened America’s position and power. The Neocon behavior is that of a cornered beast. Every potential adversary is deemed a potentially mortal threat, generating a ceaseless flow of self-destructive over-reaction. What does an opponent do in this circumstance, against an enraged, hyper-reactive foe who senses its own erosion of control? You play along, at least publicly. You bide your time, keeping secret communication lines open with allies and potential adversaries. You stage the Kabuki theater publicly, and communicate about real issues in private. You give the hyper-reactive Neocons a sense they’ve regained the upper hand; you placate them in small, meaningless ways to boost their wounded egos, and seek to reassure them that their power is still absolute. Then you begin chipping away at the foundations of their grasp on power. Two can play at the damaging-secrets-released-to-the-public game, so you play that, releasing the goods to WikiLeaks and other sources. You plant articles undermining the core Neocon narratives in influential journals such as Foreign Affairs. You hold private meetings with private-sector and public-sector movers and shakers, letting them know that the winds have shifted against globalization, Neoliberalism and Neocon narratives. You let them know that hedging their bets by advancing anti-Neocon people and narratives would be smart–very smart. This is how The Long Game is played. For crying out loud, people, the political threat to the Neocon Empire hasn’t even been around for three months, and it’s already been declared dead on arrival. Put yourself in the shoes of a patriotic insider who understands the Neoliberals/Neocons are a mortal threat to America’s interests. If you go public with your views, you’ll get your head handed to you. The only way to play The Long Game in an internecine war is with great patience, and out of the public gaze. Let’s see how things play out over the next few years before we declare the insider opponents of the Neocons have already lost. 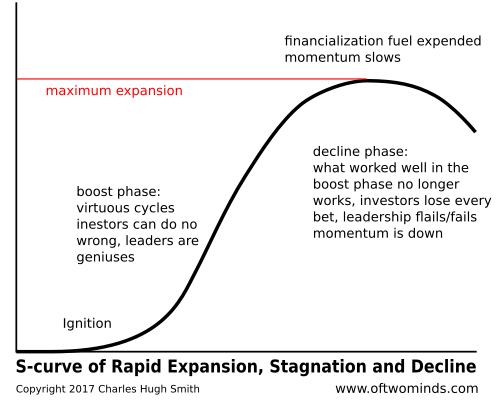 a través de oftwominds-Charles Hugh Smith: Who’s Playing The Long Game–and What’s Their Game Plan?